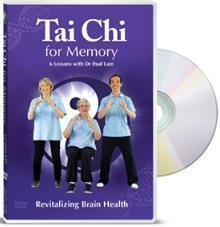 An Empowering Programme Studies have shown tai chi improves memory and brain health. Dr Lam's team merged medical research and traditional Chinese medicine with tai chi to create an easy-to-learn program. It is especially useful for people with memory loss, Alzheimer's disease... read full description below. Caring for people with memory loss is challenging for carers and family. This mind-body programme engages everyone for a quality time together. It will improve most aspects of health including balance, immunity and relaxation, and can be practiced and enjoyed by anyone.